The limited edition Ormsby Sharks have officially landed and will be going into stores across the UK in the coming days. Get in touch to find out where to get your hands on a particular model as stock is very limited. Ormsby guitars are very proud to welcome to Sophie Burrell of Saints of Sin to the Ormsby family. Sophie is an incredibly talented young guitarist and we can’t wait to see and hear what she does armed with an Ormsby. Go check her and her band out! A couple of snaps with a custom copper top before Sophie's Hype arrives! With Run 4 currently in production at WMI the wait for the Goliaths is nearly over! "We will be getting our final build date this week. Then we book flights and head up there. We've passed the point of having guitars delivered by boat before Xmas so we will be air freighting them in now. I know Hipshot were air freighting parts either late last week or early this week. WMI got the first bridges off the line (7s were first) the week before last so they could start running bodies. (They need at least one bridge to confirm routs and intonation). Ormsby Run 4 Goliaths Incoming! The news we have all been waiting for! All pending Ormsby containers held up by CITES have been released. Scheduling of the production will happen over the next few weeks, taking into consideration all companies effected. The Goliath GTR features a unique headless stock piece that reduces the weight and size of the guitar dramatically when compared to more traditional guitars and is tuned at the bridge. The Goliath utilizes an easy access bolt-on neck construction that gives the player full control over its 24 stainless steel frets, and a beautifully balanced D shape with round shoulders provides just the right feel and 'meat' to the neck. As with all our GTR models, the Goliath utilises our custom wound pickups to produce a variety of tones that allow your guitar, effects, and amp to function in unison and retain their individual characteristics. This guitar can go from the cleanest cleans to the heaviest of metals (or djents!) with plenty of tones in between thanks to its coil-splitting options. Multiscale is a standard featur of the Goliath Headless GTR and helps to complete the ergonomic benefits of the guitar as a whole. We've teamed up with Hipshot Products USA once again to create a custom bridge piece that is of the highest quality to provide comfort and longevity on the road and in the studio. Every Goliath Headless GTR comes with a custom fitted gig bag that is compact, functional and most importantly durable. Run 3 Ormsby's have landed in Guitarguitar Epsom and Glasgow! Ormsby's in Scotland! Guitarguitar Glasgow will be the second dealer of Ormsby Guitars in the UK! Guitarguitar Glasgow will be receiving Ormsby guitars run 3 models in February 2017 but they are already available to pre-order on their website , Please click here to take a look! Just in time for Christmas! Guitarguitar Epsom have just taken delivery of Ormsby Guitars Run 2 models. The feedback so far has been incredible and we can't wait to see them in shops across the UK! 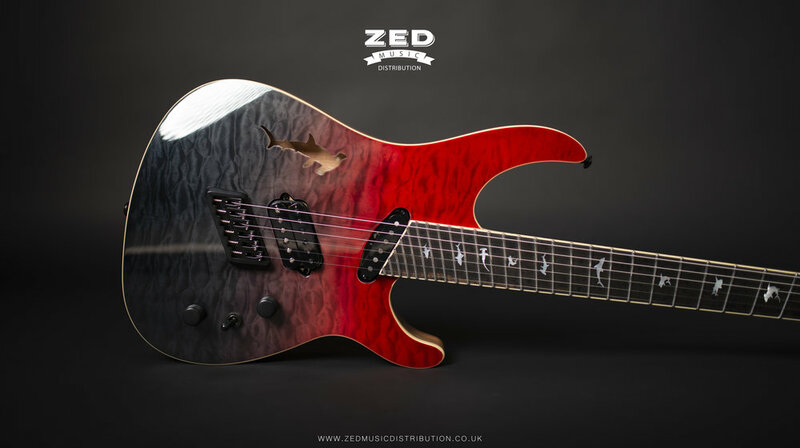 Zed Music Distribution are extremely excited to announce that ZMD is now the official sole distributor of Ormsby Guitars in the United Kingdom! Building on the incredible reputation and success of the Custom Shop designs, Ormsby released the GTR range. The GTR production range is the first production series from Ormsby, encapsulating the iconic custom shop magic and features like custom hardware made in the USA by Hipshot Products, pickups wound to the same specifications as Ormsby's custom models, stainless steel frets, and much more; the GTR range sets a new standard for affordable production guitars. Zed Music Distribution will be bringing the Ormsby GTR range to the UK for Christmas 2016! Stay tuned for our first dealer announcements.